The catalyst layers of fuel cells are an important component where the electrochemical reaction takes place. The catalyst layer must have large surface area as well as high transportation property for hydrogen, oxygen, electron and ion. In general, the catalyst layer is prepared with air spray or screen printing techniques. 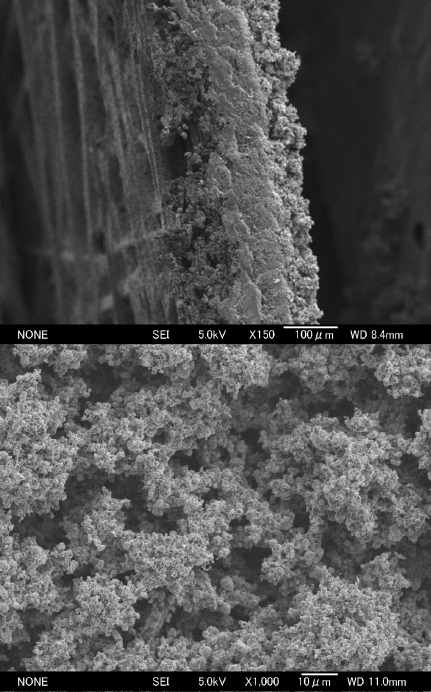 We are trying to obtain high performance controlling the catalyst layer structure with electrospray technique, which applies high voltage to the spray nozzle to make very small catalyst/ionomer particles. Besides, we can improve catalyst utilization in manufacturing. S. Okuno and N. Katayama, “Gradational Structured Catalyst Layer for Proton Exchange Membrane Fuel Cells,” ECS Transactions, vol. 83, no. 1, pp. 87–91, Feb. 2018. T. Yuki, N. Katayama, M. Takahashi, K. Tsuchiya, H. Sakai, and M. Abe, “Effects of Ionomer to Carbon Ratio and Operation Conditions in Direct Glucose Fuel Cells,” ECS Transactions, vol. 83, no. 1, pp. 145–149, Feb. 2018. T. Yamanaka, N. Katayama, and S. Kogoshi, “Fabrication of Catalyst Layers for Anion Exchange Membrane Fuel Cells By Using Electrospray Deposition.,” ECS Transactions, vol. 71, no. 1, pp. 211–215, Feb. 2016.